We hated to say goodbye to the Texas Gulf coast. Even with the overcast gray skies, fog and rain the whole time we were there we loved it. We knew we would miss the salt air and the sound of the waves from our campsite at Mustang Island but we had lots more of Texas to see. 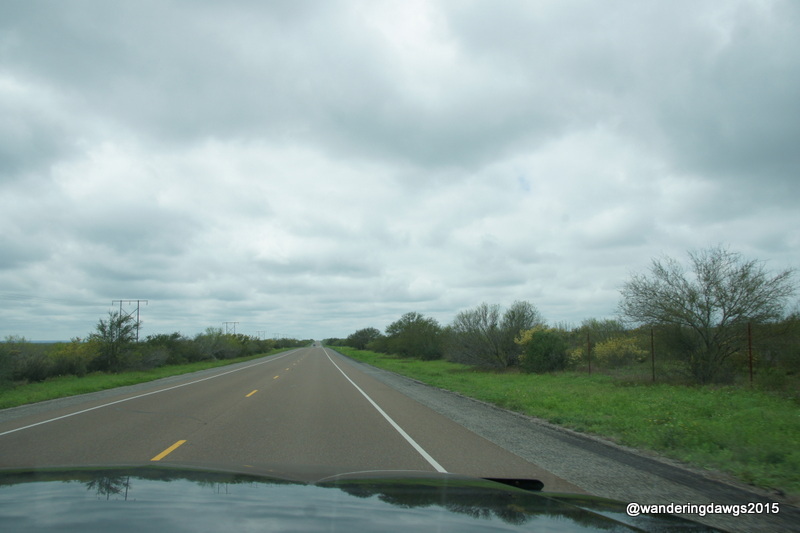 Our journey from the Gulf took us across miles and miles of Texas to Laredo. On either side of the road were fields of cactus, mesquite and blooming Yucca plants. I spotted the tail of a wolf or coyote going into the brush on my side of the road. Henry and I both saw wild turkeys. We arrived at Lake Casa Blanca International State Park on a beautiful, SUNNY Sunday afternoon. Finally, blue sky! The park was filled with families enjoying Sunday afternoon picnics. One of the goals of this trip was to see the Texas bluebonnets in bloom. The state flower of Texas, the bluebonnets usually reach their peak in late March and early April. Texas is the only place in the world where two of the bluebonnet species are found growing naturally. We didn’t expect to see any blooms until we were farther north in Texas but Mona Liza over at Lowe’s RV Adventures had spotted bluebonnets around Lake Casa Blanca before we arrived. Thanks to her I was on the lookout and found a small patch in the campground and one of the park rangers told us about a patch near one of the picnic areas in the park. The small field was covered with bluebonnets! What an unexpected treat to see bluebonnets so early in our trip! We spent 2 nights in Lake Casa Blanca International State Park. Our site was a paved pull through with water and electric hookups, a picnic table under a covered shelter, and a fire ring. There were willows and other trees around our site and we could see the lake through the trees. There is a boat launch, fishing pier, and many picnic areas in the park. The park is located near the loop road and close to restaurants and shopping. Mona Liza inspires many of us! So glad you found so many beauties, too! Ah, those lovely bluebonnets. When we left San Antonio, Mom talked about them all the time. I grew up with a nice-size print of a field of bluebonnets in an ornate frame that always had pride of place at every house we lived in. Jean, everywhere we drive we are both on the lookout for them! They are beautiful to see. Holly, they are a sight to see and worth a trip to Texas! We are starting to see them in patches beside the back roads and have seen some huge fields covered with the bluebonnets. Of course whenever I spy the big fields they are on the wrong side of the road or we are in a place where we can’t stop to take photos. The bluebonnets have eluded us during our travels thus far. They sure are pretty! Ingrid, photos don’t do them justice. We are still early for the peak blooms but we are seeing more and more of them each day. We love Cranes Mill! Thanks for telling me about it. You seem to be achieving all your goals on this trip. The bluebonnets are beautiful! Great shots Beth! I loved the one of Blondie and Henry with the bluebonnets. Yea for sunshine at last! Sherry, we are in the Texas Hill Country between San Antonio and Austin now and we are starting to see a lot more of the bluebonnets. Yes, we’ve crossed off everything on our bucket list for this trip but we are not ready to come home yet! Judy, It’s worth a trip to Texas in the spring just to see these beauties! Beautiful flowers! We must have just missed them. Your description of the campgrounds that you visit is a wonderful idea. Very helpful information. Bridget, they are starting to bloom around the hill country now. We are seeing more each day. I’m glad you like the campground descriptions. Reading blog posts about someone’s experience in a campground sometimes helps us decide where we want to go. So happy you got to land in that beautiful sea of blue…so unusual to see shades of blue. What a gorgeous backdrop! Lovely shots. We were thinking of running back to Los Fresnos via Laredo – not exactly a direct route but after all the miles this month decided against it. sigh. so many things we want to do. I have never seen The Bluebonnets. I need to get there to experience their beauty. Your sweet pup looks to be enjoying them as well!! We seem to have timed our arrival here just right for the bluebonnets. We left Laredo over a week ago and have been seeing more and more of them each day. You are soooooooo lucky and yea for you! I love the shot of Blondie surveying the bluebonnets. They remind me of the hillsides covered with lupines that we have in Alaska. Beautiful. I just loved the fireweed and wildflowers in Alaska! The bluebonnets in Laredo were just a tease. The bluebonnets and other wildflowers have been getting better every day! Wow, the state park looked so different and beautiful with all the bluebonnets blooming not in a corner but all over. I was amazed there were so many! We also saw huge fields of them along I-35 south of San Antonio. Thanks again for your post about seeing them in Laredo.